“SPU has completed its seismic analysis of Seattle’s drinking water system and its decommissioning test of Roosevelt Reservoir. The Roosevelt Reservoir was taken out of service in 2013. At that time, SPU decommissioned the reservoir to study its impact on the overall drinking water system while the reservoir was not in use. The goal of the study was to evaluate whether the reservoir could be permanently removed from the drinking water system and the property declared surplus. Additionally, in 2015 a seismic analysis of Seattle’s drinking water system that included Roosevelt Reservoir began. This study was designed to better understand the seismic risk to Seattle’s drinking water system and to incorporate study findings into long-term resiliency planning for the utility. After a thorough engineering analysis that encompassed both studies, SPU has determined Roosevelt Reservoir to be a critical emergency water resource for Seattle customers. And for those who did not know the Roosevelt Reservoir, now named for the neighborhood that this lies within, was originally called the Greenlake Reservoir, before I-5 was constructed in 1959, severing the current Roosevelt community from being directly part of the Greenlake neighborhood. New Member Benefit: Joint RNA & Chinook Book Membership! June 14, 2018 by Scott Cooper Comments Off on New Member Benefit: Joint RNA & Chinook Book Membership! Your RNA Membership is now a Chinook Book Membership! The RNA is proud to partner with Roosevelt neighborhood business Chinook Book to bring an exciting new benefit to new and current members; Your RNA membership is now your Chinook Book membership, too! Your membership could pay for itself in savings the next time you visit Bartell’s, Whole Foods, Community Fitness, Broadcast Coffee, Toronado, Wayward Coffee House, or any of many other local favorites! Our friends at Chinook Book partner with some of the best local, sustainable businesses in Seattle to offer discounts you can use on everything from tonight’s dinner to your next adventure all from the convenience of a mobile app. To take advantage of this new benefit, visit our Membership page. Memberships start at $20, though we offer a pay-what-you-can option for students and our neighbors with low or no income. You will receive an activation code within 48 hours to start using the Chinook Book app. Members who are current on their dues will be contacted with codes. If you have not received a code after June 30th, email membership@rooseveltseattle.org. Join us on Thursday, June 14th in the Roosevelt High School Library to engage in a conversation with Bellwether Housing, Mercy Housing Northwest, and Sound Transit about their plans to create 245 affordable housing homes with ground floor daycare, retail, and public plaza adjacent to the light rail (6600 Roosevelt Way NE Seattle WA, 98115). Find their flyer here. 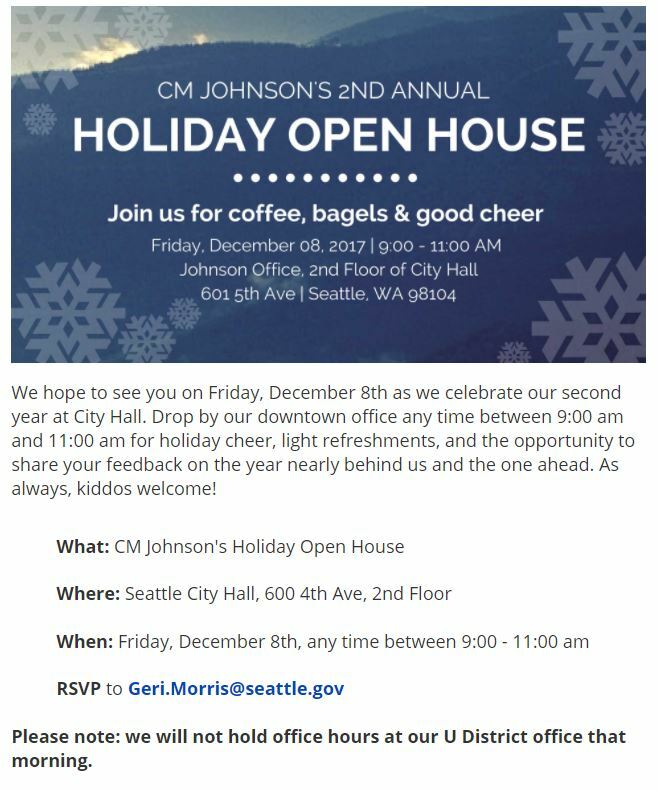 Bellwether Housing (one of the Non-Profit developers for the Roosevelt TOD affordable Housing project) is hosting an open house of their new completed affordable housing project in the University District. This project includes unit types that will likely be similar to the Roosevelt TOD project. 100% of these units are affordable. 40% are units that are 2-3 bedroom, and the remainder are studios and 1-bedrooom units. 2018 is well underway, and the changes to the Roosevelt neighborhood keep on coming! Join us at our March 20th RNA General Meeting to learn about upcoming transportation changes affecting Roosevelt, get updates on land use, and give us feedback on what you want to know more about! The RNA General Meeting schedule has shifted this year and we want to make sure that our neighbors mark their calendars! In 2017-2018, RNA General Meetings will be held on the following Tuesdays from 7:00-8:30pm (social at 6:45) at the Calvary Christian Assembly. Agendas will be distributed in advance to the RNA’s e-mail list and posted to the calendar on our website as soon as they are finalized. 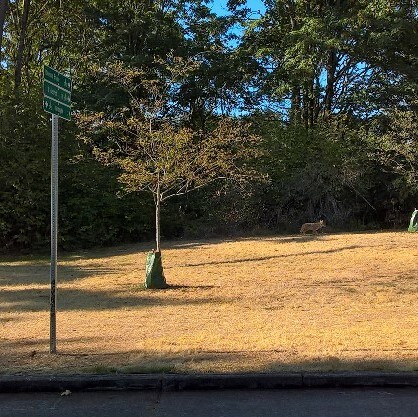 Coyote sighting in Ravenna Park? September 12, 2017 by Dave Wood Comments Off on Coyote sighting in Ravenna Park? Interested to hear comments on how frequent these sighting are, and whether this is a concern for folks in the neighborhood.